Fun and easy to learn! TK O'Brien's Pickin' Stick is like a cross between a guitar and mountain dulcimer. 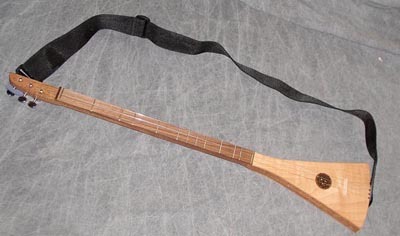 It is held like a guitar but constructed like the dulcimer. It uses a play by numbers approach like the dulcimer but the number system is "upside down" from that of the dulcimer. It's tuned to DAD. Because it plays like the dulcimer and is tuned to DAD, you can, with some easy adapting, use dulcimer tune books as a music resource. It has a great sound! 31 1/2 inch long. The top and back made of Alder. The neck is Mahogany. The fretboard is Walnut. Tuning gears are chrome with a closed gear box. Comes with playing strap, carrying case, pick, simple playing instructions with 12 familiar songs.